I'm a freelance photographer specializing in family portraits. I have taken photos of more than 800 couple weddings and 1000 families portraits. I'm good at taking photo who is shy. If you or your family couldn't take smile photo, please tell me. I can take a lot of smile photos. I can take photos all over Japan at your preferred places. 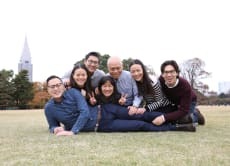 My family was in Tokyo to celebrate my father's 70th birthday and we were looking for a photographer in a pinch. Naoko was extremely experienced, professional and kind. She was also a joy to work with and immediately put everyone at ease! She was full of energy and suggested many cute & funny poses. We had great time with her and are very happy with how the photos turned out :) Thank you Naoko!